GoBus have announced some timetable changes, effective from Monday 10 October 2016. There is a new 2:45am service from Galway Coach Station to Dublin Airport: this is a direct service with a journey time of 2.5 hours. Full timetables are available here (Dublin airport) and here (Dublin City). 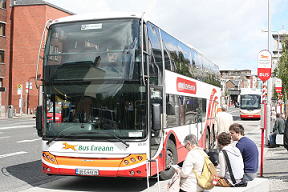 Bus Eireann have announced timetable changes on Route 20/X20, Dublin to Galway, via Athlone and Ballinasloe, effective from Sunday 11 September 2016. CityLink have announced that from 1 September 2016, their coaches from Dublin Airport to Galway will leave from new bus stops at Dublin Airport. Multi-stop / commuter services will leave from Zone 13.